Last week Harker scored with two cross country league champs and sent a solid contingent to the NBA. That’s right, the United Spirit Association sent Harker’s varsity and junior varsity dancers to perform at halftime during the Sacramento Kings game against the Portland Trail Blazers. Let’s get to it! Junior Corey Gonzales and freshman phenom Niki Iyer both became league champs when they won their races at the league championship cross country race last Friday at Crystal Springs. Senior Claudia Tischler, who placed 10th, will join Gonzales and Iyer in competing in the CCS Championships Saturday, also at Crystal Springs. Gonzales and Iyer are widely considered to be contenders for the state meet. 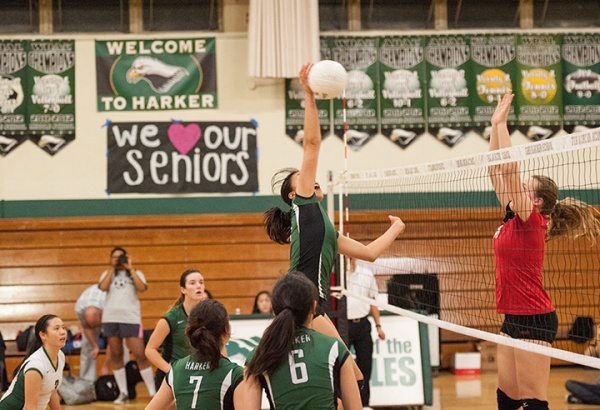 The girls varsity volleyball team enters the CCS tournament ranked fourth in its division after losing to Menlo and then defeating Mercy San Francisco in its final game of the year to end the season and celebrate its senior night in style. The team travels to Carmel tonight for its first-round match-up. If the girls win, they will return home to host a quarterfinal match at Blackford on Saturday night. The JV team, meanwhile, became league champs! The team ended its year with a 9-1 record in league play and a 22-5 record overall. The JV football team upped its record to 5-1 after a thrilling, one-point squeaker of a win over North Salinas High, 20-19, at Davis Field on Saturday. In the win, Harker leapt out to a 13-0 lead after quarterback Keanu Forbes, grade 11, threw two touchdown passes to Nikhil Ramgiri, grade 10. North Salinas then scored 19 unanswered points, jumping out to a six-point lead until late in the fourth quarter when a clutch 27-yard reception by freshman receiver Nicolas Bean kept Harker’s hopes alive and set up a 39-yard touchdown catch by sophomore Johnathon Keller. Keller snagged the pass from a scrambling Forbes and sprinted it into the endzone, tying the game up at 19-19. Kicker Alyssa Amick, grade 11, avenged an earlier blocked kick with an extra point to give Harker the win. All told, Forbes threw for 248 yards and three touchdowns, and freshman Will Park ran for 38 yards. The final game of the season is on Saturday at 11am against Leigh High School at Davis Field. All students in attendance can enter into a free raffle to win prizes. The boys varsity team went 2-1 in its season-ending tournament, trumping Cupertino and Santa Clara. The girls, meanwhile, lost a heartbreaker in double overtime against Wilcox in the league tournament, finally falling by a score of 11-9. Delaney Martin, grade 11, Jackie Shen, and Anushka Das all scored two goals in the loss. Anna Levine, grade 12, Lea Daran, and Yazmin Narin added goals as well. Helena Dworak, grade 10, played a tremendous game in the cage with 13 saves, including three saves in one-on-one’s in overtime. Harker’s varsity and JV dancers performed during the halftime show at a Nov. 9 NBA game between the Sacramento Kings and the Portland Trail Blazers. Their performance was sponsored by the United Spirit Association, whose instructors taught the material to the students the day of the game. The dancers had a great experience performing at the professional game at Sleep Train Arena. ​Today, the girls varsity volleyball team hits the road to play Carmel High School at 7 p.m. in a first-round CCS match-up. On Saturday, junior varsity football wraps up its season with an 11 a.m. game against Leigh High School at Davis Field, with prizes available in a free raffle for fans in attendance. At noon, three of Harker’s runners — Corey Gonzales, Niki Iyer, and Claudia Tischler — compete in the CCS Cross Country Championships. If the girls varsity volleyball team wins tonight, it will return home on Saturday night to host a quarterfinal match at Blackford at 7 p.m.